"The word of God, as Alma said, is like a seed planted in our hearts that produces faith as it begins to grow within us (see Alma 32:27-43; see also Romans 10:13-17). Faith will not come from the study of ancient texts as a purely academic pursuit. It will not come from archaeological digs and discoveries. It will not come from scientific experiments. It will not even come from witnessing miracles. These things may serve to confirm faith, or at times to challenge it, but they do not create faith. Faith comes by the witness of the Holy Spirit to our souls, Spirit to spirit, as we hear or read the word of God. And faith matures as we continue to feast upon the word. 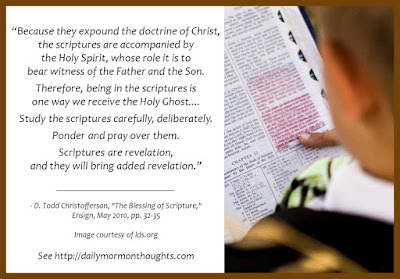 "Because they expound the doctrine of Christ, the scriptures are accompanied by the Holy Spirit, whose role it is to bear witness of the Father and the Son (see 3 Nephi 11:32). Therefore, being in the scriptures is one way we receive the Holy Ghost. Of course, scripture is given through the Holy Ghost in the first place (see 2 Peter 1:21; D&C 20:26-27; 68:4), and that same Spirit can attest its truth to you and me. Study the scriptures carefully, deliberately. Ponder and pray over them. 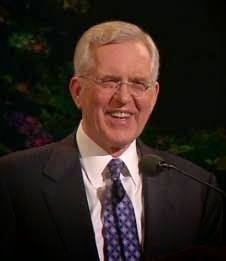 Scriptures are revelation, and they will bring added revelation." The challenge to us is to "Study the scriptures carefully, deliberately. Ponder and pray over them." Then we will find the promised blessings of faith and strength.